Brought to Turkey from Switzerland two weeks ago after being smuggled out of the country, the ancient sarcophagus of Heracles caused a boom in visitors to Antalya Museum, where it is being exhibited. Stolen from the ancient city of Perge in Antalya's Aksu district in the 1960s, the Sarcophagus of Heracles was brought to its homeland on Sept. 14 thanks to a legal struggle initiated in 2010 when it was found in Switzerland. Its exhibition in Antalya Museum began with a ceremony on Sunday with Minister of Culture and Tourism Numan Kurtulmuş in attendance. 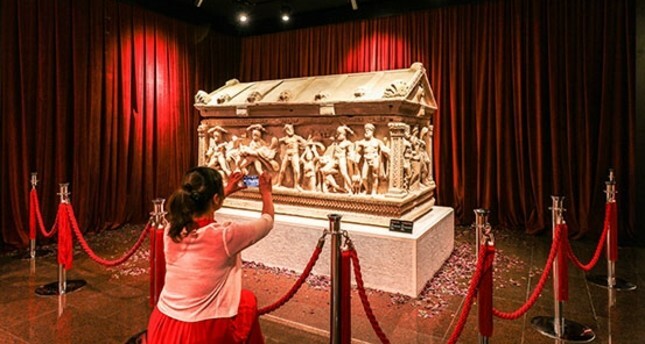 Speaking to Anadolu Agency (AA), Director of Antalya Museum Mustafa Demirel said that their average number of visitors had been between 150 and 200 a day before the sarcophagus arrived. Indicating that the museum was enlivened after exhibition of the Sarcophagus of Heracles, Demirel added that nearly 1,000 people, the majority of whom were Turkish, visited the museum on the first day that the sarcophagus was on display. Demirel added: "There is great interest from all parts of society. The museum has witnessed a large boost in the last two weeks. We have many visitors who come to see the sarcophagus." The third sarcophagus belongs to Heracles Saying there are various sarcophaguses from Perge in the museum, Demirel reported that these sarcophaguses have wreaths, columns and medallions. Mentioning two more sarcophaguses in the museum on which the 12 labors of Heracles are depicted, Demirel added that one was captured when it was about to be smuggled in Istanbul and that the other was excavated at Perge. Indicating that having the depictions of the 12 labors of Heracles, the newly brought sarcophagus is no different from the other ones in the museum, Demirel said, "The most prominent feature of this sarcophagus is its homecoming thanks to the collaboration of the General Directorate of Cultural Heritage and Museums and the ministries of internal and foreign affairs." Demirel implied that the Ministry of Culture and Tourism has been making serious attempts to take back historic pieces that were smuggled abroad. 1963 from the Dumbarton Oaks Museum in the U.S. to exhibit it in its homeland. Indicating they learned that the Sarcophagus of Heracles was brought to the Antalya Museum from TV and newspapers, Ahmet Buldu said, "I observed the sarcophagus and other works with great excitement." ose times. We have great values. I am surprised how they took these big pieces abroad." Students at Adem Tolunay High School that visited the museum under the supervision of their history teachers examined the sarcophagus. One of the students, Oğuzhan Yakar, noted: "We are really sorry about historical artifact smuggling in Turkey. These are all the artifacts of our country, and there are others who want to take them from us. It is natural. However, we will prevent it. We will do whatever is needed." The Sarcophagus of Heracles is exhibited in a special lounge in the hall where sarcophaguses belonging to the Perge period are on display. On the sarcophagus of the mythological character who is known as Heracles in Greek mythology and as Hercules in Roman mythology, there are figures describing 12 labors of Heracles. Dating back to the Roman Period (the 2nd century A.D.), the sarcophagus, which is 235 centimeters in length and 112 centimeters in width, is categorized under the group of "Minor Asia Sarcophaguses" and labeled as "Terra Nova" according to archaeology literature.